In the book of John Jesus and Nicodemus had a whole conversation about being born again. Nicodemus even questioned about entering his mother’s womb again because he was confused about being born again. Then, Jesus so lovingly explained to Nicodemus that it wasn’t a physical rebirth, but a spiritual rebirth. You must be born of the Spirit and of water. That means the next thing to do is, vocally expressing that you believe and accept Jesus as your Savior. However, to move forward with your being born again, you must sincerely repent of (turn away and not go back to) all sin in your life. Also, by profession of your faith, being baptized with immersion in water. Living a life reflecting Jesus Christ. So, you would then need to find a Bible believing, preaching, and teaching church family to be a part of to help you grow in our faith. At some point, it would be good to grown enough (spiritually maturing) in your faith to the point that you also share the gospel (basically, what I’m doing here, in a way) to lead others to the saving grace of Jesus as their Savior. The scripture image is the Romans Road to Salvation, which is used widely by many Christians to help a person become saved and reborn. Where do you stand? I’ve left this post sparse on purpose. It’s meant to cause you to question your faith as well as to ask questions to get clarity and if you’re not born again, to hopefully lead you to be born again. Eve was the first sinner and saw the fruit of her sin as she stood at the world’s first grave and buried her dead son. After confessing her sin she heard the Lord say to that serpent, the devil, “And I will put enmity between you and the woman, and between your seed and her seed; he shall bruise your head, and you shall bruise His heel.” (Genesis 3:15). With this first promise of the Redeemer, there started the wicked path of life ending at the cross where Jesus Christ, born of a woman, presented a satisfying victory over sin and Satan. Through a woman, God’s just universe was ruined and became “a world of sinners lost, and ruined by the fall.” Now, through a woman, a perfect salvation has been given for a sinful people. Through Eve’s sin, death came into the world, but at the cross, both sin and death were defeated, through “dying, death He murdered.” When Jesus cried, “It is finished,” He meant that the serpent’s head, symbolizing power and authority, had been bruised. He defeated all satanic principalities and powers that Eve’s sin brought into the world, and put them under His feet. any temptation is a common occurrence, and each of us should learn from the first person on earth to be tempted, its way of reaching and continuous actions, and protect ourselves from a fall through the benefit of Jesus Christ’s own victory over the enemy. There is no sin in being tempted. We only sin when we give way to temptation. Refusing to give way to the attraction of sin, our Garden of Eden awaits perfect. At the heart of Eve’s wretched story, however, is the good lesson that a woman has the power of burden or blessing over a man’s life. If she falls, man falls with her. In asking loyalty to Christ, Paul relates Eve to represent the quickness that one is wicked (see 1 Timothy 2:12-14). So, there you have it. The Biblical account of Eve. How can you relate to Eve’s story? Comment, let’s interact. Next week: we’ll be talking about, Elizabeth, mother of John the Baptist. 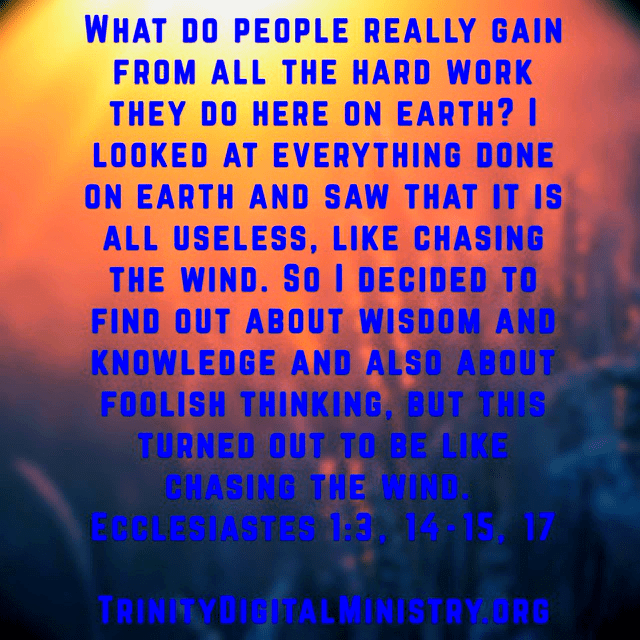 We were made to do His Good Work. His Gift of salvation makes us who we are. We are unable in and of ourselves to save ourselves. There’s not one iota we can do to save ourselves. Because of our salvation, we do good works. We do it because we want to; not because we have to. We hunger for it! How does that look in your life? Comment, let’s chat about it. The test to us who live in this life of greed and materialism is not to pursue real advantage in earthly things and convenient lifestyles, but to focus on the things that are above (Since you were raised from the dead with Christ, aim at what is in heaven, where Christ is sitting at the right hand of God. Col. 3:1). We will gain our fulfillment only in Yahweh. Where do you find yourself today? What are your thoughts on greed and materialism? Comment and let’s chat and interact. I’d like to hear your feedback. Me? There was a time in my past where I was caught up in materialism and was somewhat of a hoarder. Yahweh changed all of that. He helped me see “the light” and changed my heart. In quiet and in thought the Christian character is formed and perfected. But not in the quiet of the still, the self-gratification, or the pretender. When the Christian is freed from the removal of his responsibilities in life, the world has no draw for Him. His prayer is, that all matters relating to the Spirit can live and grow in Him, and surrounded by Him. So are the fascinating interests and pursuits of him who the world unfairly assumes unhappy, and ignored his true interests. In obedience and meekness, the humble Christian chooses to turn away from the view of all; yet the Lord takes pleasure in honoring him. Mainly, though, may the source be the administering angels who will be sent for the soul of the Christian. Their coming may alarm, though the leaving soul will find the Lord its power and its share forever. The church is named the Shulamite: the word implies fulfillment and peace; not in herself, but in Christ, such that she is complete, through his honor; and has contentment, that he made for her by his blood, and gives to her by his Spirit. Amazing! Because of Christ’s gift of salvation we’ve been made complete, we choose to live our lives in Him, for Him, and be content in doing so. Comment how Yahweh has blessed your life. Let us know. We want to celebrate HIM with you. Praise Yahweh. Christ is with us in His Spirit. Believers being made right through the Salvation of Christ makes her beautiful with spiritual grace, even though her thoughts and actions aren’t always pure, she shows a heart that’s being fed by and growing in the Word of Yahweh. How awesome is that? 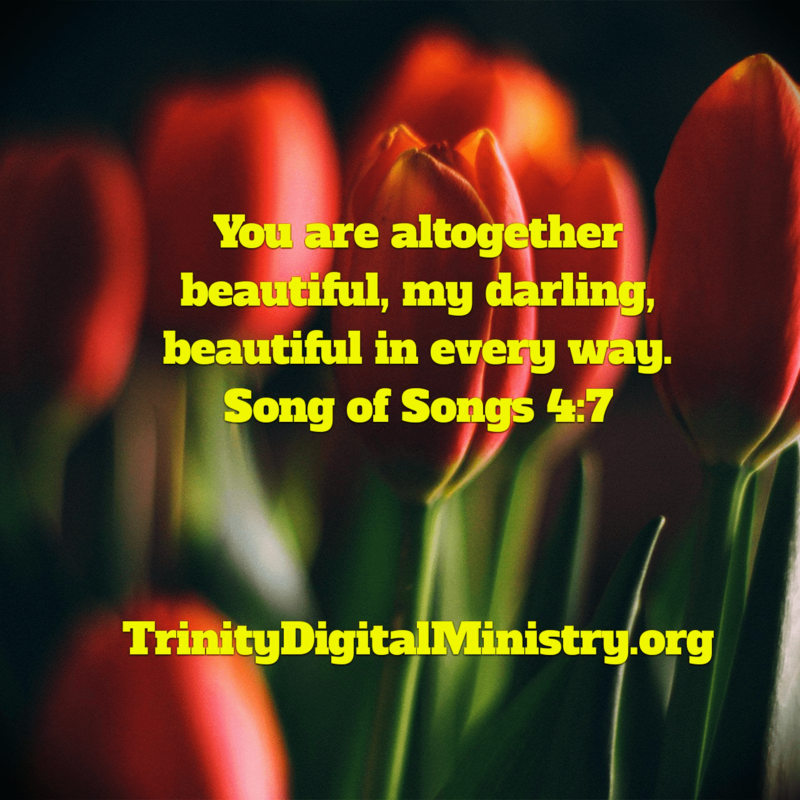 Yahweh thinks we (believers) are beautiful even when we mess up, because of Christ’s salvation to wash us clean. The Savior, Christ, is our Mediator and Comforter. Comment your experience with Christ as your Savior, Mediator, and Comforter. How has it shown up in your life? To read all of chapter 4 text you can go here. It’s not long. It’s the embellished version of v. 7. Wow! What a visual. Read the full text of scripture here. 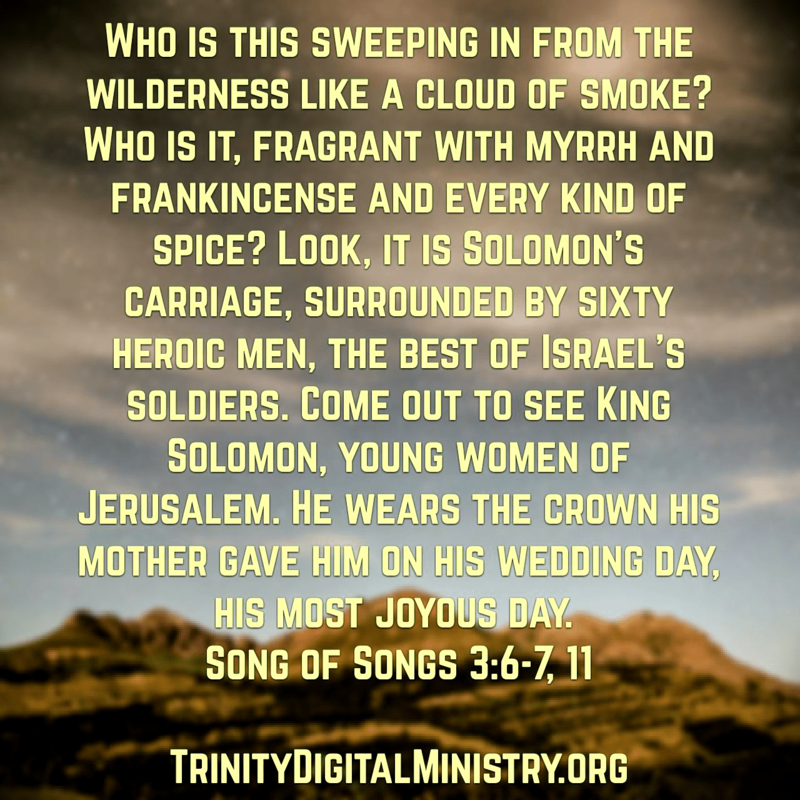 It includes 3 more verses that say more about Solomon, his bodyguards, and his carriage. This obviously isn’t exactly like King Solomon’s. However, this is the style scripture speaks of. 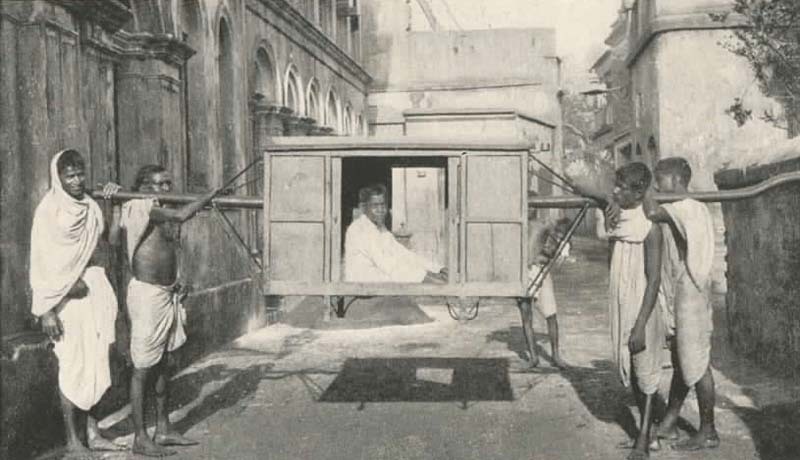 In India, it is called: a palanquin. The wilderness is symbolic of the world; the believer emerges from it when he is freed from the love of its sinful desires and amusement, and objects to its rules and ways, to search for joy in fellowship with the Saviour, Jesus. A poor soul will spring up, at last, under the direction of the Yahweh; like a fog of incense rising up from the altar or the smoke of the burnt-offerings. This implies sacred and faithful friendship and the soaring of the soul toward heaven. The believer is filled with the graces of God’s Spirit; his faithfulness is now very excited. These blessings and encouragements are of the divine “Promised Land”. He, who is the Peace of his people, the King of the city of Yahweh, has given safe passage for his redeemed from the wilderness of this world. The platform, or man-powered carriage, was made for rest and easy transport, but its glamor and elegance showed the quality of its owner. It was very elegant and glamorous. Unlike the image above. The church is totally guarded; large amounts of people are with her than are against her: believers when they rest in Christ, and with Him, but they have their troubles, are still safe. The carriage here implies the covenant of salvation, the way of our salvation. This is the work of Christ, that makes Him loved and honored in the eyes of believers. It’s created and built, both for the glory of Christ and for the well-being of believers; it is wholly fixed in all things and secure. Salvation is final! The blood of the covenant, that deep purple, is the cover of this carriage, so the believers are protected from Yahweh’s wrath, and the difficulties of this world, but the heart of it is that the love of Christ that outdoes knowledge, this is for believers to have peace. Christ, in His gospel, reveals himself. The believer must stay in the Word, and be completely obedient to Christ. Pay particular attention to His crown. Associating this to Christ, it speaks of the honor placed on Him, and His power and authority. This is most awesome and excellent! Praise You, Jesus, Yahweh, for Your gift of salvation and our Eternal home with You. He loves us without condition! Nothing we’ve done is so bad that He won’t love us. Just come to Him! He’s waiting for you. Where’s your eternal home? Have you accepted Christ as your savior? Comment and bless others as well as yourself. Do you need prayer? If so, contact me, now with your request, here. A team of prayer warriors will lift your request to Yahweh. With all the social issues going on around us we need to bring out focus back to our Creator, Yahweh. So, this message is strong. Man was created to live and breathe in an atmosphere of praise-filled worship to The Creator. Without Yahweh, we are nothing less than self-centered, self-pitying, and complaining (see Gen.3:9–12). But upon receiving salvation and life through Jesus Christ, our daily living calls us to prayer and the Word for fellowship and wisdom in living. Our daily drawing near to God in that union is to be showered with praise: “Enter into His gates with thanksgiving And into His courts with praise.” Such a walk of praise-filled acceptance to Him will nurture deep devotion, faithful obedience, and constant joy. We can move into each day that we live knowing that a praise walk is not wild and offhand, nor decreased to insignificant ritual but, a walk of life-saving power is available to those of us who believe in Jesus. The Holy Spirit is a renewing spirit. The Bible says: He saved us because of His mercy. It was not because of good deeds we did to be right with him. He saved us through the washing that made us new people through the Holy Spirit (Titus 3:5). I know, that sounds creepy. But, it’s the truth, isn’t it? We must attend our own carnal spiritual funeral, first, willingly. I know that is a tough thing to do. However, it’s required to live a Christ-centered life. I struggle too! You’re not alone. How are you doing with this? Leave a comment. I enabled google commenting to control the spammers. Yahweh has covered me with the clothing of salvation, and decked me out with the a robe of righteousness. Yahweh has given believers righteousness and salvation. Lift up your hands in praise to the Almighty Savior. He sent the Messiah, Yeshua, to be sin for us to save us from an Eternity in hell. Are you praising Yahweh today? Share what you have to praise Yahweh about. Do you need prayer? Contact us for your prayer request. We have a prayer army waiting to lift you up.